Since my early days as a classroom teacher in Appalachia, I’ve searched for opportunities to allow students to become creative producers. 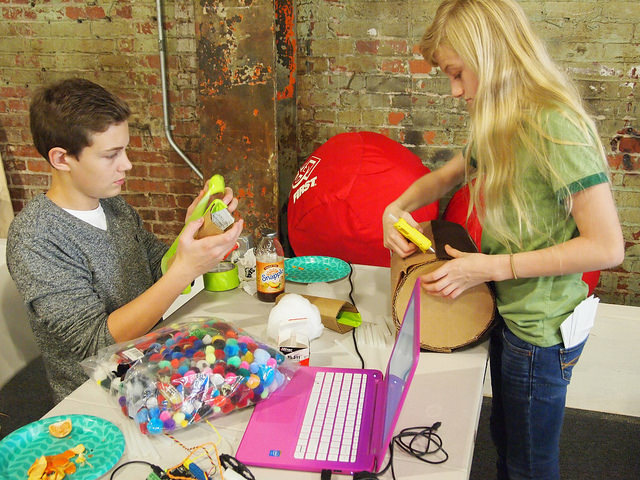 The image in this story comes from a Makeathon sponsored by Birdbrain Technologies. 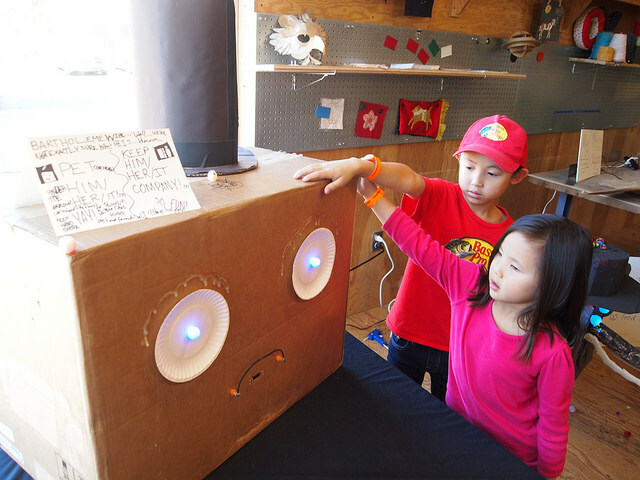 The students designed and created robots for a Petting Zoo at the Children’s Museum. It was great to see young children and their parents interacting with the robot pets. Our Makeathon is a free event where high school students can experience a fun introduction to programming, design, and engineering. The Makeathon is designed to be beginner friendly. The goal is to introduce kids to technology in a creative and welcoming way. The idea for the initial Makeathon came from Techhive who held the first event at the Lawrence Science Center in Berkeley. Tom reworked the ideas and I along with Bambi Brewster and Aparna Brown assisted Tom to develop the guidelines for the first Robot Petting Zoo in Pittsburgh. Tom wanted to have two full days, a Saturday and Sunday, for the high school students to learn the basic principles of building and programming with the Hummingbird Kit. The students applied on a first-come, first served basis. Thirteen students – seven girls and six boys – signed up. Using a survey designed by Aparna the students were paired into teams. It was amazing to see how quickly the teams began to collaborate. The students also were challenged to design pets with whom a young child would interact. The “pets” could be real or imaginary creatures. Using cardboard, tape, boxes, and scraps of fabric the students created a unicorn, dragon. elephant, monkey, or bird. Along the way the students used the CREATE lab visual programmer or Scratch to make the pets interactive. Tom and a group of adult mentors gave suggestions to improve the engineering and the programming elements. By the second day, Sunday, the students had seven robots ready to take to the MakeShop at the Children’s Museum for the Pittsburgh MakerFaire.